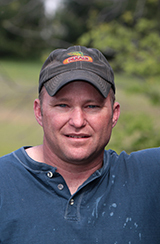 H&C Farms includes JC's father, Jim, who is semi-retired; his brother, Matt; and their partner, Mike Cady. They grow 2 /3 corn and 1 /3 soybeans on 3,800 acres. Partners Matt and Mike also have a seed business. Mike's family includes his wife, Lamonica; daughter Kassi (sophomore in college); son Logan (junior in high school). Henrekin majored in agronomy at Western Illinois University and worked for an agribusiness company for seven years before working his way into the farming operation. He and Lamonica, who is a registered nurse, rented extra ground in the beginning and have since purchased additional farmland to include in the overall operation. Henrekin does some custom spraying with his Hagie high-clearance sprayer as well as handling the spray duties on the family farm. He has been fine-tuning the nitrogen program in corn, applying 60 to 100 units at V-10 to tassel. This father and son team, along with other family members, farm about 8,500 acres, and irrigate 35% of their corn/soybean acreage. They also run 35 head of cattle for an online club calf sale. The Ungers reached their best corn yields ever in 2017, with a 230-bushel per acre average with one field averaging 296 bushels per acre. They're always edging to increase that figure, and say micronutrients are the limiting factor to higher yields on their farm. Micronutrients now are the top of the list of five on-farm field tests they plan to run during the 2018 crop season. 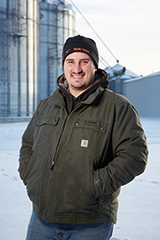 "Micronutrients may not be a big concern if you're farming deep prairie soils," says Lance. "But here in the Wabash Valley in southwest Indiana we've got everything from beach sand to heavy clays." The Ungers will be running side-by-side strips in both corn and soybeans to compare different micronutrients and micronutrient combinations. Micronutrients to be evaluated include boron, sulfur, manganese and zinc. As another father and son duo, the Zoerbs are focused on use their on-farm research in their crop planning. When they put together their crop plan each year, it is never the same. Whether comparing planting systems, hybrids or the latest crop protection products, the south central Nebraska irrigators are always trying something new and re-evaluating older ways of doing things. 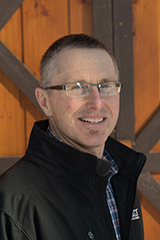 BASF innovation specialist Eric Steiner has a lot of respect for the Zoerbs' farm trials, noting that with their record-keeping, results don't get lost. "In my mind, what they do is what every farmer should do," he says. "With different practices and different soils, you only know something works if it works on your farm." Steiner appreciates what he learns from their plots and reciprocates by offering them the chance to try new BASF technologies. "Nine times out of ten, they are up for trying things," he says. "They get first look at new products, and we get validation of our products in the field." Rick, along with wife Carla, operates about 1,000 acres, with 800 owned and 200 rented. They grow continuous corn and alfalfa, with 200 acres of alfalfa grown for a local dairy. 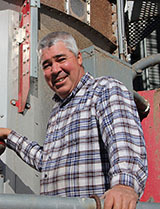 In 1996 Rick bought the original 160-acre farm from his parents who started the operation in 1972. Hargrave participates in the National Corn Growers Association annual yield contest and in 2017 won the no-till irrigated national corn contest for Wisconsin in the farms test field. The Hargraves do some remote farming operations, as their residence is 250 miles north of the farm. The live on the farm for about 7 weeks in the spring and about 8 weeks in the fall, returning back to the farm occasionally during the growing season. Rick and Carla are Evangelical Christians and their faith is first priority and they incorporate it into all aspects of their lives. Rick says, "I have the privilege to do jail ministry in our local county, and one of the teachings I leave the inmates with is to surround themselves with good people when they get out."